↑ D. Saimaddinov, S. D. Kholmatova, and S. Karimov, Tajik-Russian Dictionary, Academy of Sciences of the Republic of Tajikistan, Rudaki Institute of Language and Literature, Scientific Center for Persian-Tajik Culture, Dushanbe, 2006. 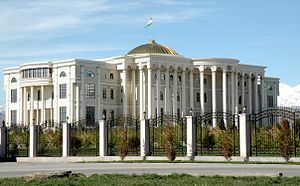 ↑ "TAJIKISTAN - DUSHANBE". Centro de Investigaciones Fitosociológicas. สืบค้นเมื่อ 10 November 2011. ↑ "Climatological Normals of Dushanbe". Hong Kong Observatory. สืบค้นเมื่อ 10 June 2010. หน้านี้แก้ไขล่าสุดเมื่อวันที่ 7 พฤษภาคม 2560 เวลา 20:02 น.